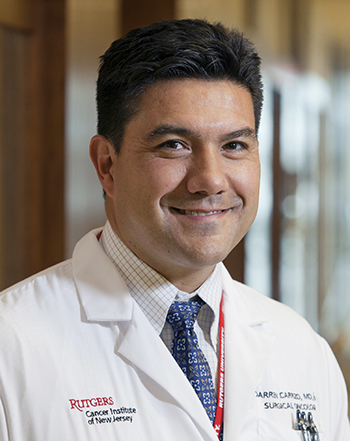 New Brunswick, N.J. – Rutgers Cancer Institute of New Jersey researcher and surgical oncologist Darren R. Carpizo, MD, PhD, has been awarded a $1,839,863 grant (R01-CA200800) from the National Cancer Institute to build upon research from his laboratory examining a drug compound that restores tumor suppressor function in the most commonly mutated gene in human cancer – the p53 gene. The aim is to provide the foundation for the development of a new class of anti-cancer drugs that will target p53, resulting in broad activity against all cancer types. The p53 gene is known as the “guardian of the human genome” in that it recognizes cellular stress and stops cell proliferation by either allowing the cell to recover from the stress or activating a protein that induces a program to kill the cell if the damage can’t be repaired. The loss of this function can result in cancer cells escaping a controlled environment and multiplying throughout the body. Previous research by Dr. Carpizo’s laboratory identified a drug compound that restores tumor suppressor function by targeting a common p53 mutation known as p53-R175H. This mutant is non-functional, as it fails to bind to zinc which is required for the p53 protein to maintain a normal, physical structure and function properly. The drug compound, which Carpizo’s team previously tested on human cell lines in the laboratory, has been found to restore structure and function to the p53 mutant protein by restoring zinc binding as well as activating a program that selectively kills cancer cells with the p53-R175H mutation while leaving normal cells undisturbed. The mechanism of action which Carpizo and colleagues have termed “zinc metallochaperones” is novel. “Pharmacologic restoration of the normal structure and function of a mutant protein with a zinc binding defect is unprecedented in drug development. Reactivating mutant p53 with a drug has been one of the ‘holy grails’ of anti-cancer drug development,” notes Carpizo, who is an associate professor of surgery and pharmacology at Rutgers Robert Wood Johnson Medical School. In this next phase of research, Carpizo and colleagues aim to further study the mechanism of action of zinc metallochaperones by investigating the mechanisms that cells use to respond to increases in zinc levels. They also will investigate the spectrum of p53 mutants (besides the p53-R175H) that are zinc binding impaired as this will increase the potential pool of patients that could theoretically benefit from zinc metallochaperones. Lastly, they will be investigating other compounds that function as zinc metallochaperones. Along with Carpizo’s laboratory, the laboratories of Stewart Loh, PhD, at SUNY Upstate Medical University and Rutgers Cancer Institute Associate Member David Augeri, PhD, from Rutgers Translational Sciences at Rutgers University are collaborating on the work.